Next edition of Assets Digital coming soon! 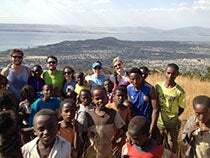 UCLA Anderson students are making a difference through their field study project work. Their project, focused on addressing breast cancer detection and treatment, creates a support system and care infrastructure in Ethiopia. Their goal is to create a self-sustaining breast cancer clinic, which can be replicated throughout the country. Through March 19, crowd-funding site, Spark, will feature this field study project, as they raise money to continue their efforts. Watch a video on their work and support their project. Three days before he accepted an Academy Award, Steve McQueen visited UCLA to share his approach to directing. To read about his visit, click here. On March 10, MEMES, the Center for Management of Enterprise in Media, Entertainment and Sports will welcome award-winning executive producer, Mark Burnett, as he discusses his upcoming feature film “Son of God”. Click here to RSVP. Dean Judy Olian, along with Dean James Ellis, USC’s Marshall School of Business, will sit down to discuss business, education and the economy. This conversation will provide a unique perspective on the challenges and opportunities facing the business world today. Mark this special event on your calendar! For event details, click here. Interested in learning about how the human-centered design process can aid in creating solutions for complex issues? Join UCLA Anderson Alumni in this hands on workshop that will lead participants through this process by learning about design thinking phases: empathy, needfinding, rapid prototyping, and user testing. Participants will leave with prototyped solutions for the Robin Hood’s $5 Million Education Prize and a new framework to help ensure product and service solutions are market-driven, user-tested, and disruptive. Mayor Eric Garcetti will join the UCLA Anderson Forecast team as they discuss job readiness and job availability in the next UCLA Anderson Forecast, “ Solutions for the City”. The forecast will also include speakers from Louvership, UPS, United Way, the UCLA Luskin School of Public Affairs, the UCLA School of Public Health, and the 2012/2013 LAUSD Teacher of the Year. Special Alumni Discount: $95. Alumni Weekend has something for everyone! Starting on Thursday night, come connect with recruiters as hundreds gather at the Executive Recruiter Networking Event. Friday is the day to refresh your UCLA Anderson education, with a Conference filled with insightful content. Hear from the CEO of JCPenney, learn the latest on big data, sports franchises, multi-platform marketing, and more. Plus, you won’t want to miss Professor Ed Leamer and the Economic Forecast! Saturday is filled with Reunion celebrations for the classes of ’79, ’84, ’89, ’94, ’99, ’04 and ’09. And Monday brings the perfect opportunity to relax and make new friends at the annual UCLA Anderson Alumni Golf Tournament. For details on all of these ‘don’t miss’ events, click here.